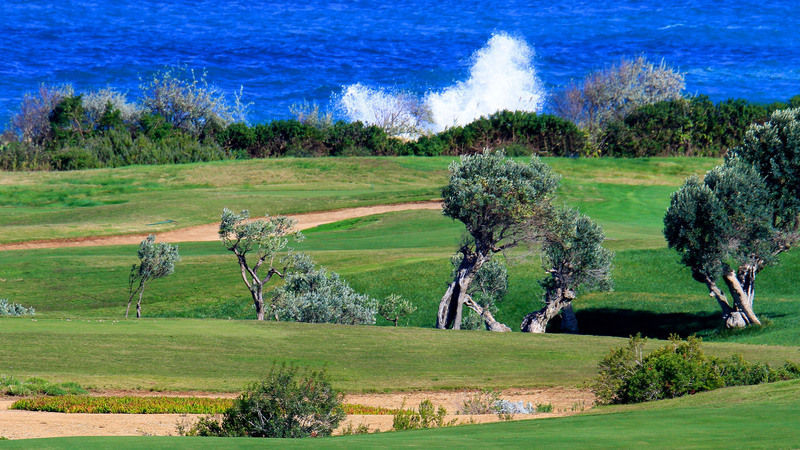 Considered one of the best golf clubs in Italy, the San Domenico Golf is a prestigious 18 hole golf course over looking the sea of Puglia: 6300 meters of meandering meadows that run between the olive trees long a beautiful stretch of Adriatic coast offering spectacular sea views. 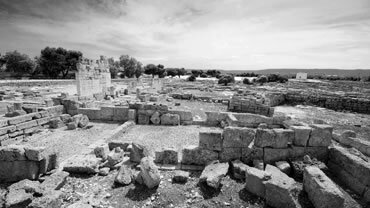 The archaeological site of Egnatia, set in a beautiful natural setting and environment, is one of the most interesting of Puglia. Cited by authors such as Pliny, Strabo, Horace, the city had a great importance in the ancient world for its geographical location; thanks to the presence of the port and the Via Traiana, in fact, it was an active center of trade and commerce. 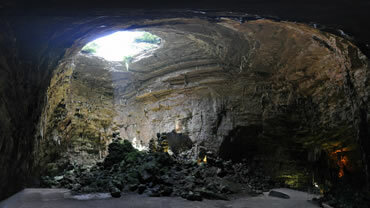 Agricultural and tourist center of the Murgia located in an area characterized by sinkholes, caves and chasms, to visit the Caves of Castellana which constitute the largest karst Italian never explored by man where the Serious Black Cave, after passing the cave of the owl, crossed the corridor Sarpente, the cave of the Precipice and Piccolo Paradiso, were each the White Grotto, called the most beautiful cave in the world, bright and shining. 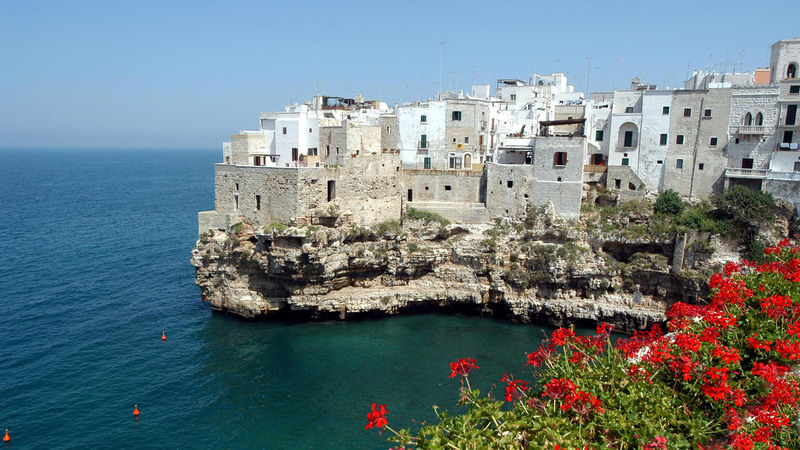 Ostuni: called “citta’ bianca” the white city, The brilliance of its white washed houses, set against the pink-tinged brown of its principal monuments, makes the town stand out in the green of the sorrounding country. Its old town, called The Earth, is unmistakable the blinding monochrome color of its settlement, strictly white from which comes its name "White City", to visit over the lovely old town, Ostuni Cathedral, the Episcopal Palace and the Palace Muncipale, the Church of San Francesco, and the Museum of Southern Murgia Pre-Classical, and an open air museum "Archaeological Park and Nature of Santa Maria d'Agnano. It 'a Wildlife Park, by car and can travel the Safari, the industry's largest and most complex of the entire park, to see and meet the animals that move within their habitats such as lions, tigers, elephants, zebras, but also camels and many others. Do not miss the tropical room, Room ornithological Metrozoo, Oceanic Industries, Theatre of the animals, and the Dolphinarium of the park and a musement park. 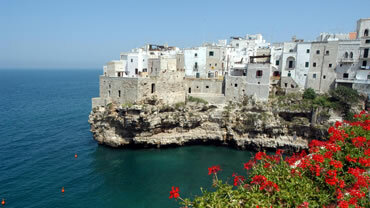 Polignano a mare: 34 km away. it is famous because its tands over looking the sea on a steep, rocky cliff cut by a deep gorge. Because of the karstic nature of this cliff a number of caves have been formed, particularly in the sea. The oldest part of the town stands on a rocky out crop over looking the Adriatic Sea. Not to miss visiting the ancient Clock Square where stands the Mother Church, the Grotta Palazzese, the Tower of sighting, the bridge of Via Traiana, the Old natural harbor with the "Bastion Saint Stephen." and “Mago del gelato” the hystorical caffe’, where you can try their best “caffe’ speciale”. Known as an expression of the “Barocco Pugliese”, the town has a particularly beautiful "old city"surrounded by stone walls with prominent Baroque gates leading to piazzas and narrow, winding streets. 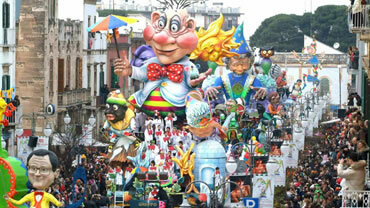 Known for its “Festival della Valle d’Itria”, the summer Opera festival in the Valle d'Itria. Pacesto be visited: the Doge's Palace, the palaces and Motulese Grassi of the seven teenth century, the Church of San Domenico and out walls of the Carmelite church, the Basilica of St. Martin, the port of Santo Stefano and the Natural Reserve of Bosco Pianelle. Similarly white, the houses are topped with unusual pitched roofs called "cummerse", a feature typical of the historical centre of Locorotondo. 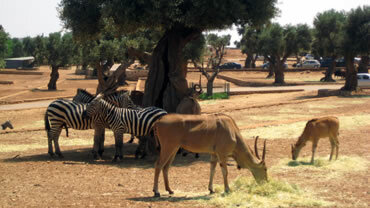 It's a tourist center of the Valle d'Itria, commercial. Locorotondo produces the famous white Italian wine DOC (denominazione di origine controllata). 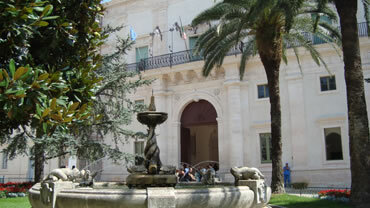 To visit: the Mother Church and the church of S. Maria della Greca, but very interesting is the Itria Valley. 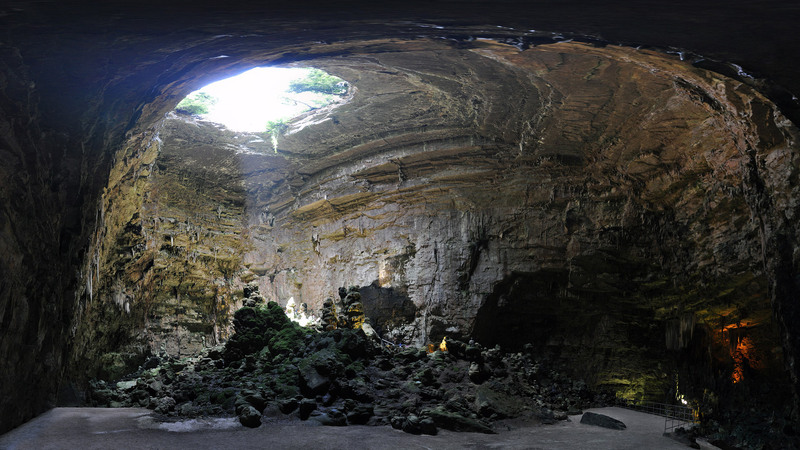 Known for it sold Carnival Festival in February, for hand made krafts and karst caves. To visit: the Church of St.Peter, the Church of Santa Maria Greca, the Carmelite church, the Cave of Putignano and Palazzo Romanizzi. The area is still rich in cultural and gastronomic. 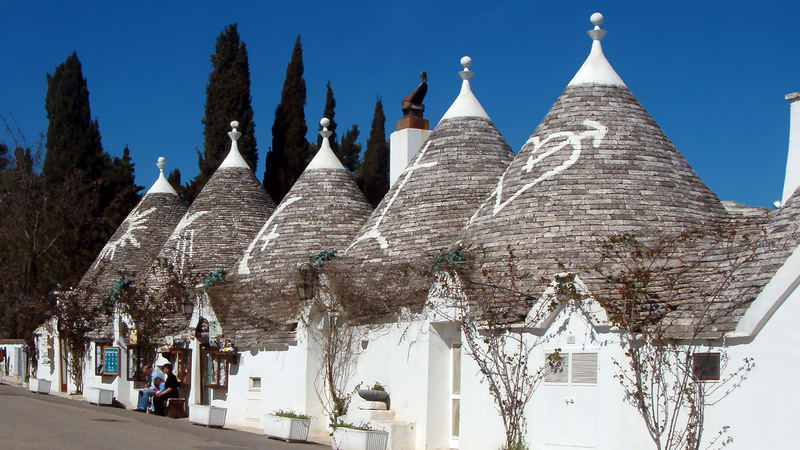 Yyou can not miss the opportunity to visit the “city of the trulli”. World UNESCO site, fascinating because it is all made by trullis, one of the most striking and unique architectural beauty. It is located 20 km away were commend to visit the “rione dei Monti”, the oldest part and explore its secrets. The scenario will be unique: Aia small, the Church in Trullo, Trullo Siamese, the Museum of the Territory, the House D’Amore, Trullo Sovrano and the Basilica Santi Cosma e Damiano, considered a World Heritage Site. 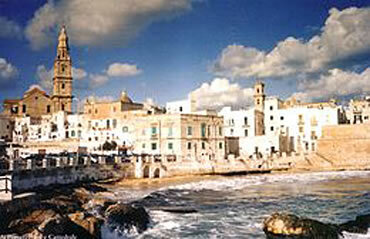 Between coastal cities of Apulia, Monopoly is one of the busiest ports of the region on the Adriatic. Its historical center of medieval origin, over lapped to the remains of a fortified village messapico already in the fifth century BC, over looking the sea, surrounded by high walls. Monopoly is also known as the city of a hundred districts. The country side is in fact divided into various places named districts, whose names evoke ancient farmhouses disappeared, the presence of a farm, a church or other historical and geographical references.